An object-oriented Application Programming Interface for the Apple Macintosh, released in 1987. It used the concept of a Rolodex-style stack of data cards, with links from card to card. It made programming very easy; so easy, that it threatened commercial Mac software. Apple didn't know what to do with it, and was slow to develop it. The last update was in 1998. Promised further updates ended up as Vaporware, and it was abandoned in 2004. 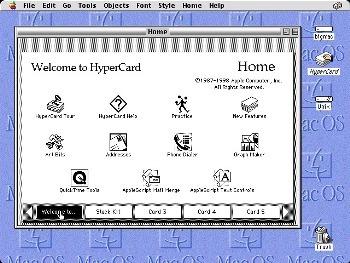 The World Wide Web is a Spiritual Successor of HyperCard (among many other things). HTTP, Java, and Wikis were all pioneered by people who had used HyperCard, and were inspired by its simple and intuitive interface.